I choose to make this peanut stuffed Hotteok. Hotteok are korean sweet pancake . Though it resembled the Indian sweet Poli / Obbatu , which we commonly make with Bengalgram or coconut sweet stuffing . 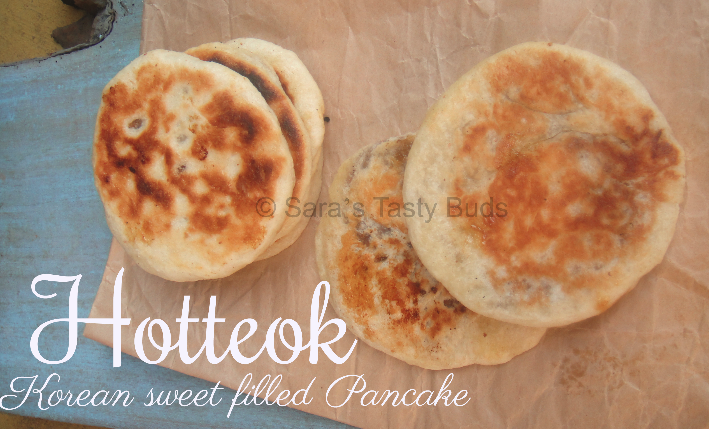 Hotteok is one of the most popular korean street food which is a sweet filled pancake. I had seen in my favorite korean dramas and shows. 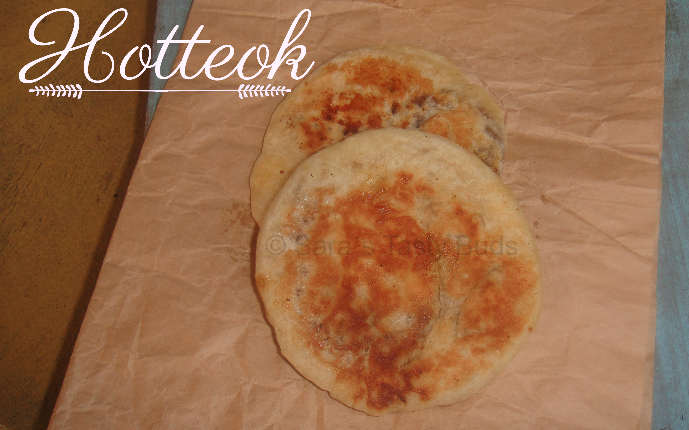 The dough for hotteok is made from wheat flour , water , milk , sugar and yeast . The dough is allowed to double. 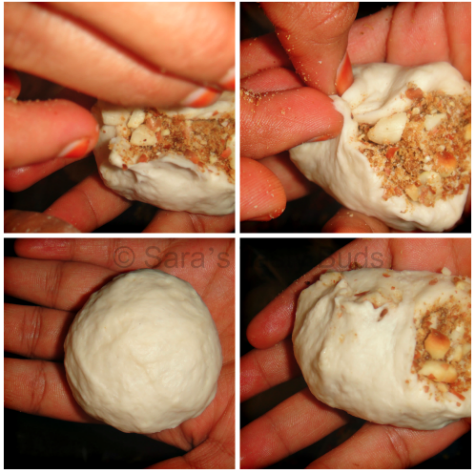 A handful sized balls of this dough is filled with the sweet filling which contain brown sugar , honey , chopped peanuts and cinnamon. The filled dough is then placed on a greased griddle and pressed flat into a large circle with a special tool with a stainless steel circle and wooden handle as it cooks. In korea , ready - made dry hotteok mix is available in plastic package. Hotteok is believed to be originated from chinese merchants who immigrated to korea after the late 19 th century. Hotteok are usually eaten during winter season in korea. Due to its high sugar content , a single hotteok may have as many as 230 calories. Other nuts like walnuts , almond , pumpkin seeds , sunflower seeds , seasame can be used. In a bowl , mix the flour , salt , sugar , yeast well. To this add the lukewarm water and knead well into a smooth soft dough. Apply oil on the dough and cover the bowl with cling wrap and let it double in size. In the mean time , roast the peanuts and remove the skin . Crush the roasted peanuts and mix the brown sugar , cinnamon powder and honey. Apply little oil in the hand and divide the dough into lemon size balls. 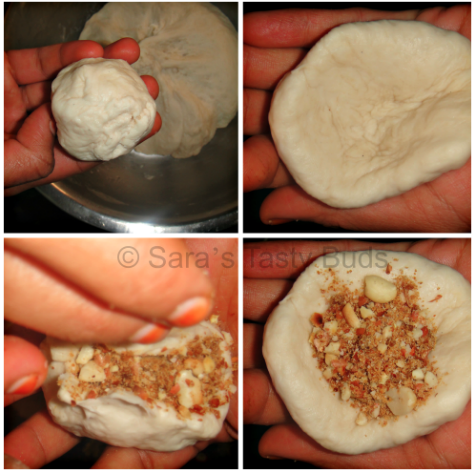 Take a dough ball in your hand , flatten into a cup shape with your hand and place a spoonful of filling in the center and seal the edges. In the same way make the remaining dough into hotteoks. Heat a griddle on the medium heat , apply the oil on the griddle . 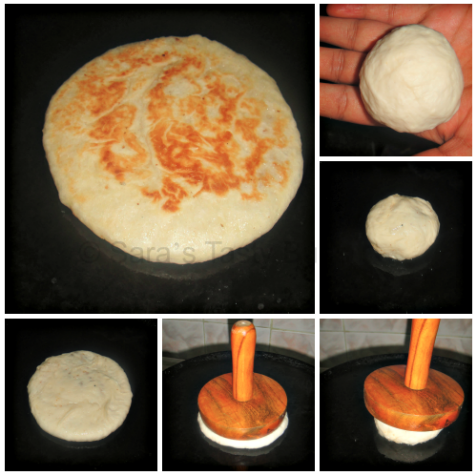 Place the shaped hotteok on the center and with the help of a round flat device with a handle , press into a flat disk and cook on medium flame . Use a lid to cover the hotteok while cooking. Flip to other side with a turner and cook on both side . Apply sesame oil on the hotteok with a brush for crispy crust. You can cook two or more hotteok at a time depending on the size of the griddle. Hotteoks are ready to be served . The smell was so good from the fried bread and the sweet filling was delicious. Wow....I don't know if I want these for breakfast or dessert...perfect for any time of the day. These sound delicious! I'm definitely giving these a try. Pinned! I made these a while back and remember how delicious they tasted. 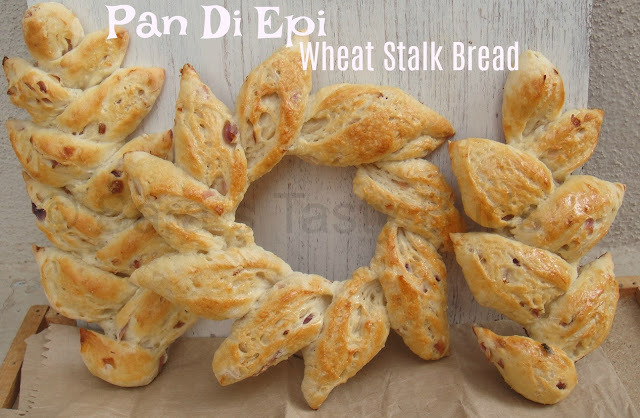 You are tempting me to make these again. Yummy Hotteoks. Love the peanut filling. Love ur shaper there!!! pancakes with sweet peanut filling, must be tasting amazng! i too made a pancake with peanut filling!!! i can vouch for the taste!!!! I want to try making these Sara looks so yum.